It’s pitch black. The dense jungle around us is oddly quiet, the creatures lurking within biding their time, waiting until we glide by in our little wooden boat before continuing on their nightly business. The only sound is the gentle slap of a paddle in the inky black water as we navigate our way through a maze of tributaries. Suddenly two eyes appear in the darkness, illuminated by the torchlight. 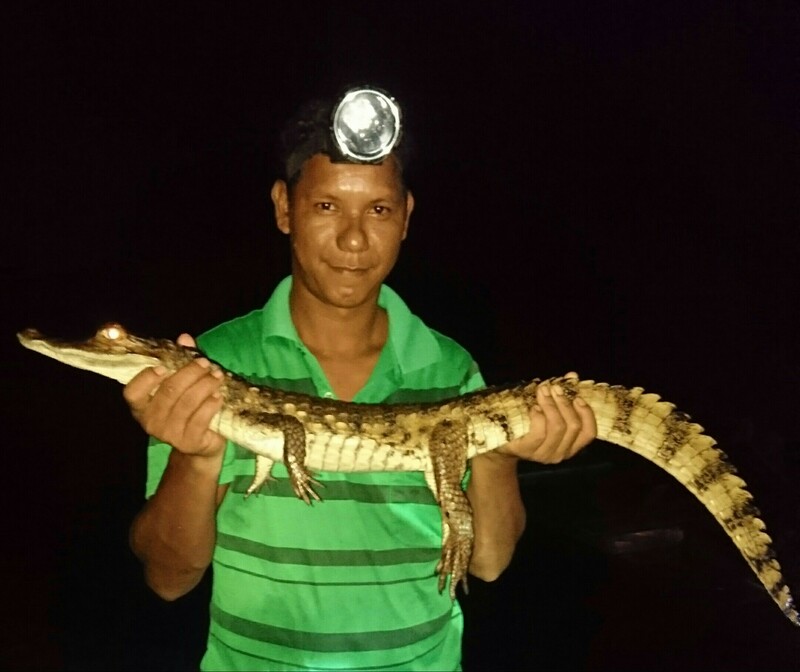 We paddle towards them and before I can utter a word, our boatman Joe plunges his hands into the water and plucks out a 1 metre long baby alligator. With his hands clamped firmly around the creatures jaw, he sets the animal on his lap before us. The boat suddenly feels a lot smaller! The aligator eyeballs us suspiciously, his cat-like pupils slide sideways, sizing us up, his shiny, leathery skin sparkling in the torchlight. We return to the safety of the jetty where Joe carefully places the creature on the wooden boards and swiftly steps back. The alligator remains frozen for a minute or so then with a flick of his tail he’s gone. 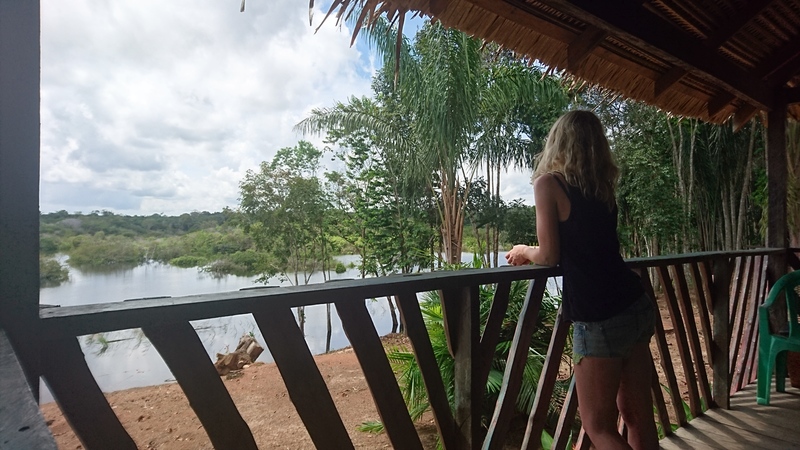 That was our first night in the Amazon jungle! As a long standing source of wonder among scientists and inspiration for countless writers and filmakers, chances are the Amazon features pretty high on your hit list if you’re travelling to South America. 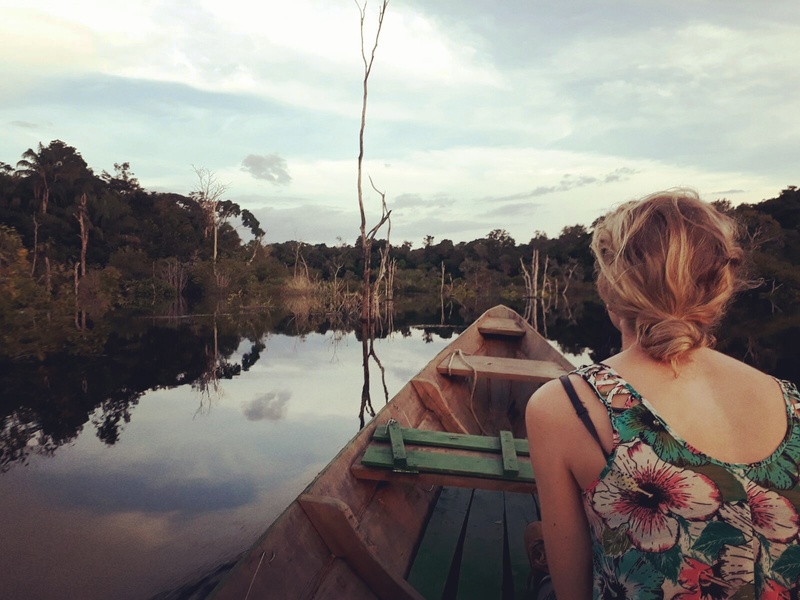 The plethora of tour companies offering near identical off-the-shelf jungle trips for increasingly low prices from Manaus might make you question that choice. The good news is there are some eco-friendly operators out there who offer a less pre-packaged trip. Here’s our guide to getting the most out of your own Amazon jungle adventure. 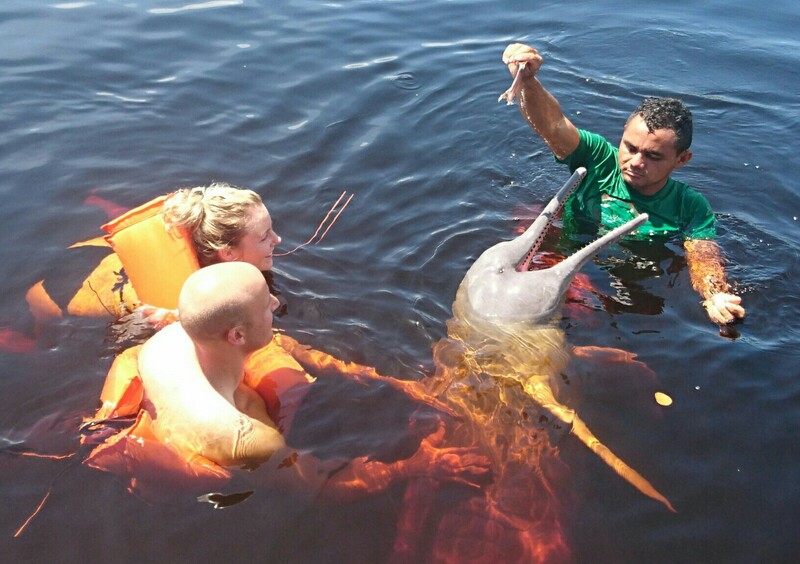 Generally speaking the more distance you put between yourself and Manaus the more authentic your jungle trip will be. After much research we chose Amazon Green Tours, an eco-friendly outfitter based on the Matuca river, a tributary of the Amazon river. The company is run by a husband and wife team who grew up in the jungle and specialise in organising excursions into virgin rainforest and remote areas. Just getting to the lodge is an adventure! 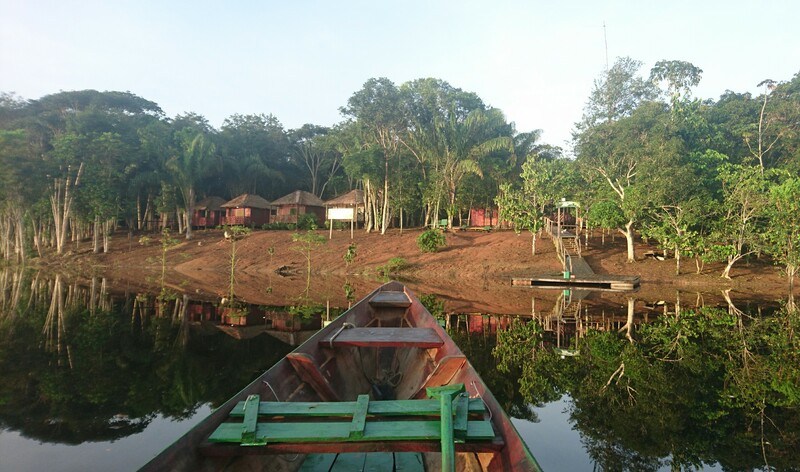 We took three different boats and two vans to reach their jungle lodge buried deep in heart of the Amazon wilderness. The last section of the journey is the most exciting. After crossing the mighty Amazon river and seeing the famous ‘meeting of the waters’, we travelled down a red dirt track for around an hour to reach a tiny ramshackle jetty. There we boarded a small wooden boat which gently chugged down a winding river lined with thick jungle foliage. As the sun set we rounded a corner and the lodge came into view: a collection of small wooden huts sitting right on the river, nestled amongst the trees. We were home! 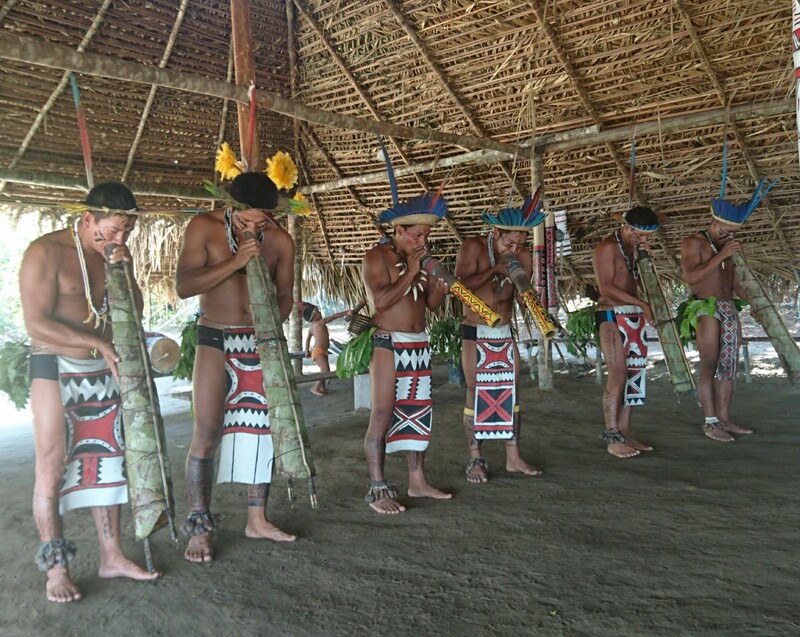 By the end of our first day with Amazon Green Tours we had been swimming with pink river dolphins, fished for pirhana, danced with a jungle tribe, eaten fried ants and stroked an alligator on a nocturnal boat ride! So if ticking off bucket list items is high up in your priorities this tour is for you! Most of the tour companies offer similar activities, but quality and group size vary hugely as mentioned previously. Our jungle trip was an action packed adventure from start to finish. It’s an early start each day to make the most of wildlife spotting opportunities so don’t expect much napping in a hammock. When we weren’t in a boat or in the jungle looking for creatures we were playing with the lodge’s affectionate resident monkey, Chico, who attached himself to us for the duration of our stay. It’s 5am and we’re gliding down the river in a little wooden canoe looking for wildlife. I’ve got David Attenborough’s soothing tones playing in my head, as the sun rises over the jungle casting a warm orange glow over everything in sight. It’s beautiful. 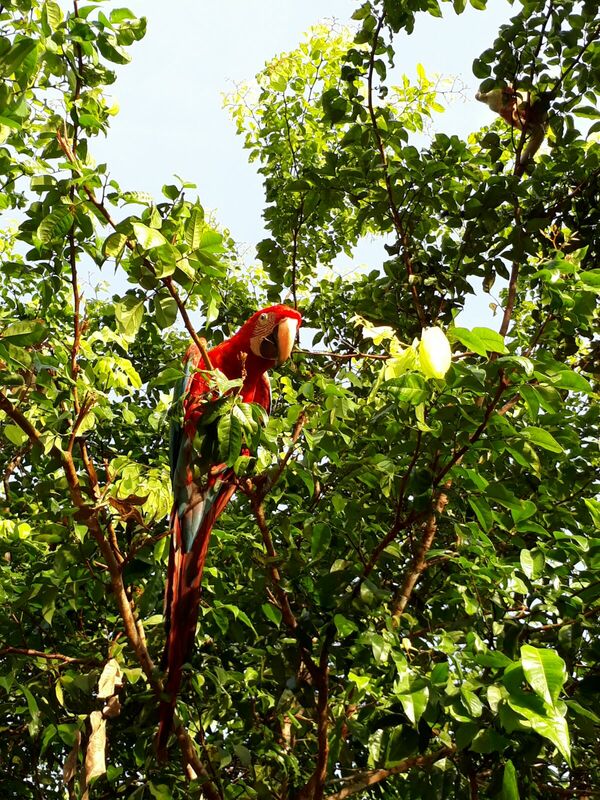 Our eagle-eyed guide Beppe points out brightly coloured toucans swooping from tree to tree and as the sun gathers strength a sloth, stretching lazily in some branches along the riverbank. After breakfast we set off on a trek to learn about all the different medicinal plants which grow in the area including those used to make anaesthetic, contraceptive and cough syrup. Armed with his machete our guide Joe literally hacked a path for us through the tangled undergrowth while Beppe presented us with a variety of nuts, seeds and leaves to eat and smell. Then after some obligatory swinging on vines and whooping like Tarzan, we returned to the lodge. 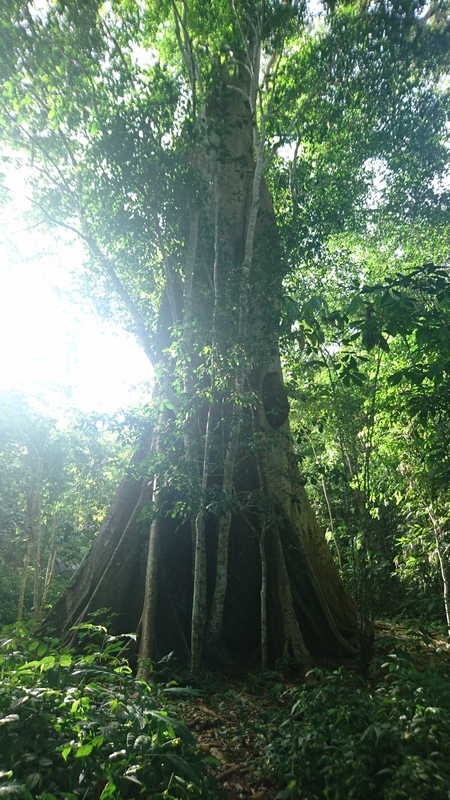 It was amazing to see what treasures can be found in the Amazon and it really drilled home the importance of protecting this amazing environment. After lunch we’re back in the boat for a final scoot around the Amazon waterways searching for wildlife. Joe produced his machete again to cut a path through the submerged trees and bushes. Paddling through those still, dark waters, ducking beneath overhanging branches and listening to stories about the jungle critters surrounding us has been one of the most magical experiences on our trip so far. 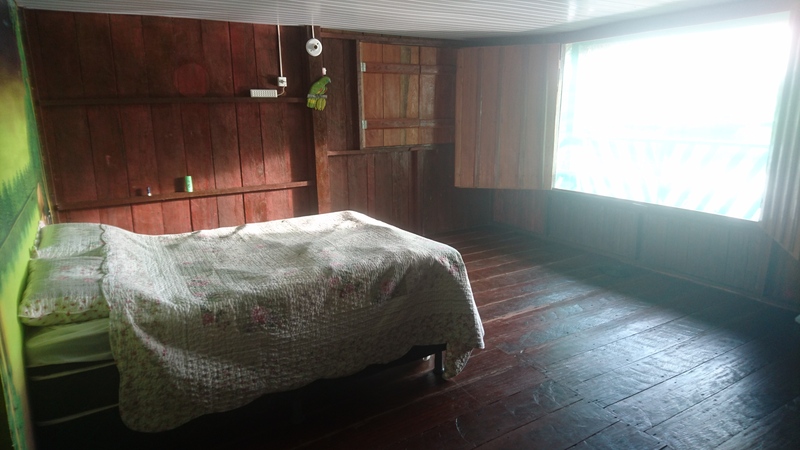 Our quaint wooden hut came equipped with a comfy bed, ensuite bathroom and even a hot shower! The best part was the two huge wooden shutters that opened onto the river so we could lie in bed and watch the sunrise over the water -idyllic! There’s no chance of going hungry at the Amazon Green Tours jungle lodge! Each mealtime brought a delicious buffet of fresh salads, rice, meats locally caught fish and fruits picked from the surrounding trees. We drank gallons of delicious juice made from cupuacu fruit, which is also used to make white chocolate and grows in the trees around the lodge. On our last night in the jungle the staff arranged a bbq over a roaring campfire and decorated the table in leaves and flowers. We ate our food from bowels made of palm leaves with wooden spoons chiseled from a block of wood by our guide Joe! We visited in May just after the wet season which meant the weather was good, but not too hot and the rivers were full so we could access a large area of jungle around the lodge. We were lucky to see a good amount of wildlife, however even more sightings are possible during the dry season from June to December. The jungle is hot and dirty so take several changes of clothes and plenty of sunblock. Long trousers and sleeves are necessary for the jungle trek to avoid being eaten to death by mosquitos. I wore leggings, a light long sleeved shirt and Rich wore khaki shorts and a t-shirt. Walking boots are also necessary to protect your feet and ankles from jungle critters. Mosquitos are a pest in the evenings too so take plenty of mosquito repellent! 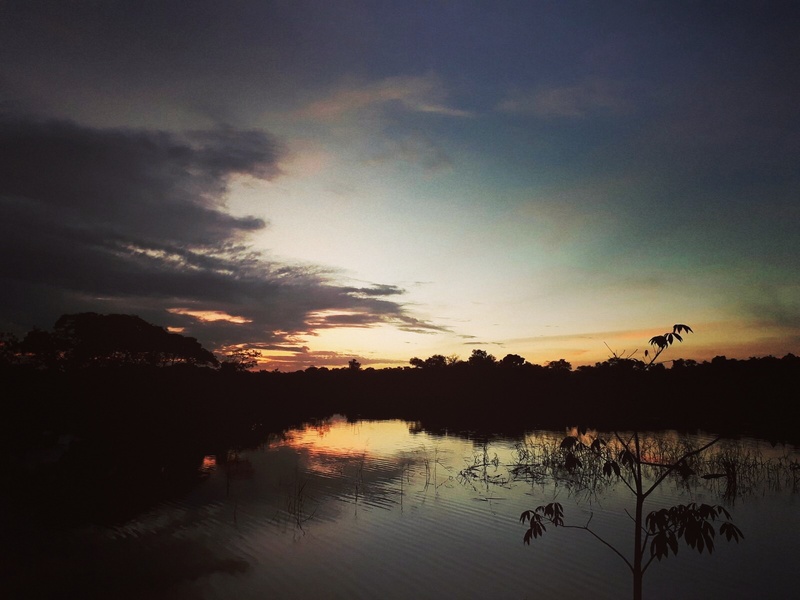 Thank you for your own vivid, atmospheric picture of the Amazon jungle. I, too, believe that I can hear David Attenborough’s soothing voice in the background. I’ve had ideas for suitable soundtracks for your previous blogs, but I think that the jungle wildlife will create its own music. Tbis looks like a lot of fun!! Amazon Green Tours are doing a great job educating national and foreign visitors. Joe and Beppe sound wonderful. 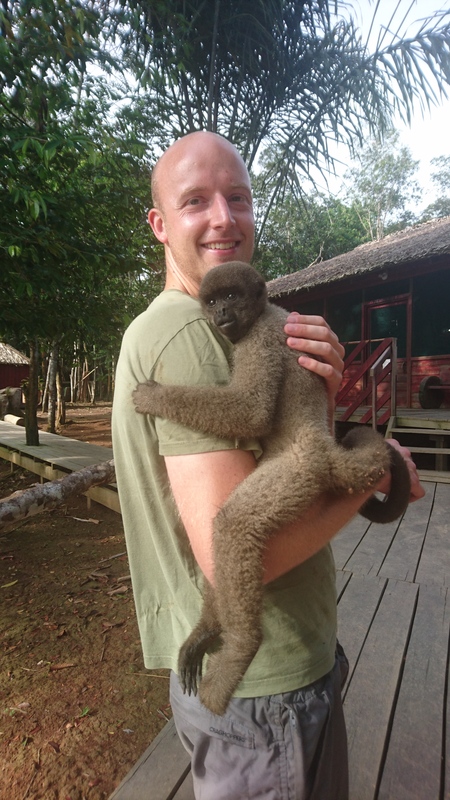 As for dear little Chico the woolly monkey, who wouldn’t adore him!